Constructed from a heavy-gauge 304 stainless steel for greater structural integrity and a longer service expectancy. This compact designed dome top waste container provides a hygienic surface with no pores to hold dirt or bacteria that is easy to clean. Galvanized liner with handles is included for quick and easy waste removal. Dome shaped top discourages placement of waste on top of unit. Equipped with rubber base ring helps keep unit in place and protects floors. Convenient pull-out liners keep trash bag hidden for a neat appearance. ►Need a Waste Container Fast? 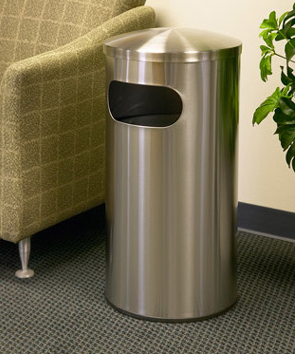 This waste container is made from at least 15% recycled material.